Deep rolling uses roller or ball burnishing of a surface with sufficient force and repetitive deformation to deliberately create both a highly cold worked surface as well as a compressive layer of residual stress. A primary goal of deep rolling cited in the literature is the deliberate creation of a highly cold worked surface layer to increase both the yield and ultimate strength of the material in order to improve fatigue strength. X-ray line broadening and micro hardness reveals that deep rolling produces even more cold work than shot peening. 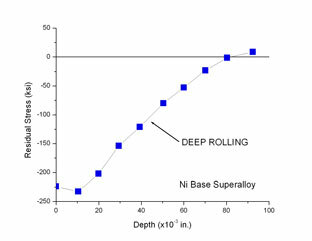 The subsurface residual stress and cold work deformation created by deep rolling are similar to shot peening, but deeper. The high cold work can be beneficial for some materials and applications where elevated temperature exposure and mechanical overload are not issues. At high temperatures the high dislocation density created by cold working allows the beneficial compression to relax rapidly by a dislocation annihilation mechanism. The yield strength gradient with depth through the cold worked layer makes the part susceptible to loss of compression in the event of even momentary overload. Deep rolling was derived from conventional surface burnishing intended to achieve a fine surface finish or component sizing, modified to control of the burnishing force rather than the interference. Processing is typically performed in a lathe on axially symmetric components such as axles and shafts. Either roller or ball tools are used to deform the surface with repeated deformation cycles and fine feed per pass to produce high cold work levels. Lambda Tech can demonstrate how Low Plasticity Burnishing is superior to any type of deep rolling ball burnishing process. For more information you can contact us by phone at (800) 883-0851 or by email here.